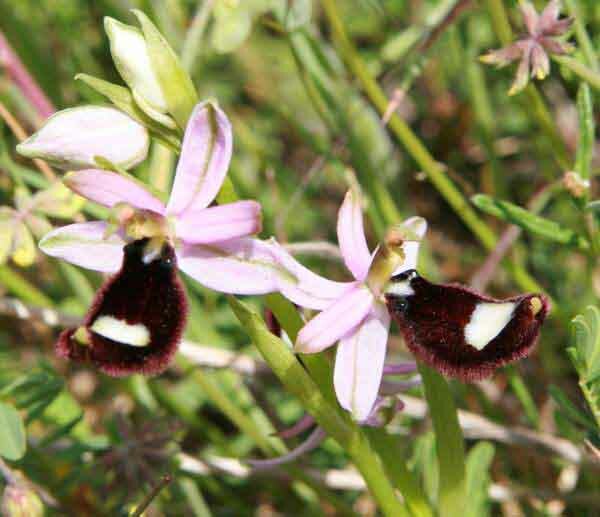 This orchid was named after a nineteenth century Italian botanist, Antonio Bertoloni, and it can be found throughout much of Italy as well as in Spain and eastwards towards former Yugoslavia. Ophrys bertolonii grows to a maximum of 45cm and carries 3-8 large flowers on each infloresence. It is the dark, almost black, velvety lip with its shiny speculum that makes the flower so attractive. The sepals and petals are a lovely shade of pale pink, sometimes tinged or marked with green - see below. 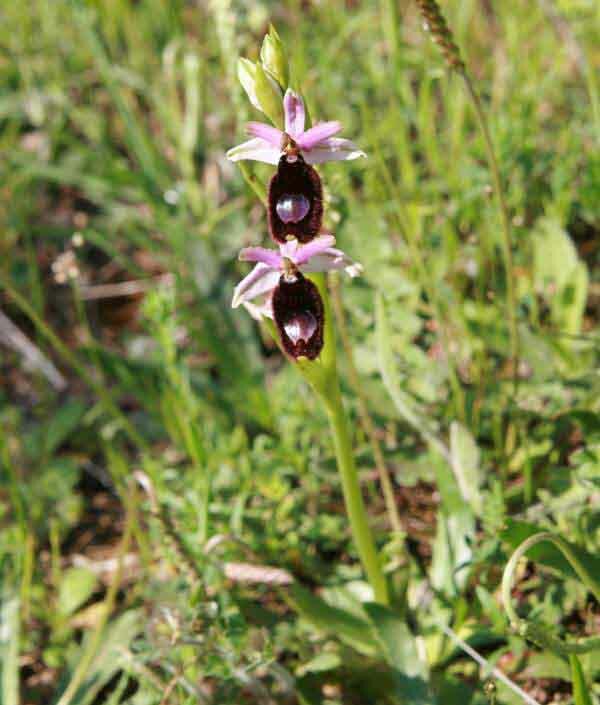 This orchid grows side-by-side with Ophrys Bertoloniiformis which is very similar except that the sepals and petals of O.bertoloniiformis are entirely greenish-brown in colour. This orchid grows in grassy and stony places and sometimes can be found in open woodland. It seldom grows to more than 45cm in height and carries between 3 and 8 flowers on each spike. 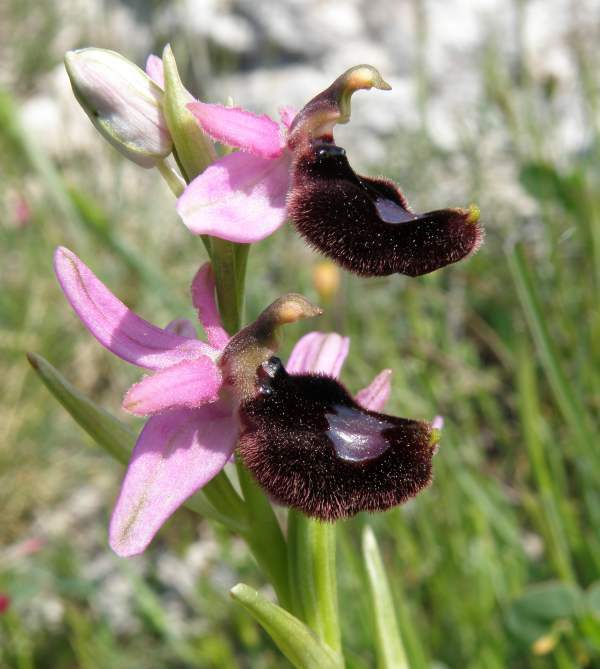 This orchid is widespread throughout much of the central Mediterranean region and it spreads as far south as Greece. It is particularly common on the Gargano Peninsula in Italy. 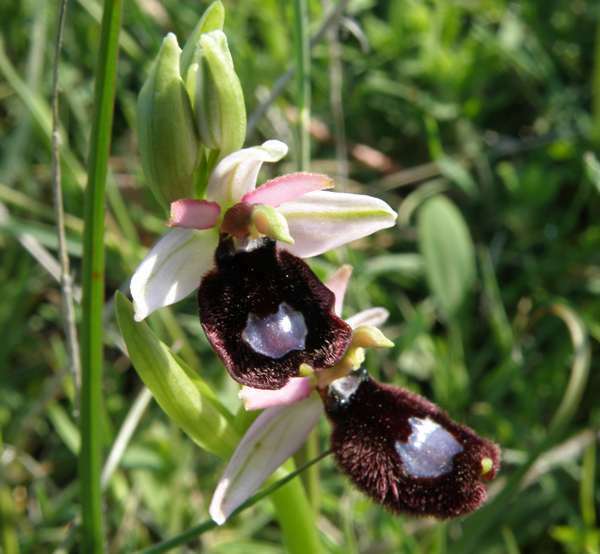 In France a rare but very similar plant occurs, Ophrys bertolonii subsp. aurelia, and there is another similar-looking orchid recorded from northern Italy - Ophrys bertolonii subsp. benacensis. Ophrys bertolonii grows in full sun on dry-to-damp unimproved chalk grassland. From late March to May. The specimens on this page were photographed close to Monte Sant'Angelo in the Gargano Peninsula in Italy in mid April.